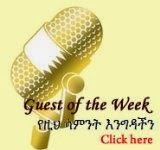 Ethiopian This Week web page ( http://www.ethiopianthisweek.com) Dec 29 , 2013 Radio show features bereavement news of the Renowned Artist Tewdros Metku and the Young and Talented Singer Mikya Behailu as well as part II interview of ERAPA Chairperson Ato Teshale Sebro.. Click here to listen the Sunday night Radio program. Singer Mekya Behilu has passed away!! Founder of ANC dies at the age of 95. What is next for Returnees?